Each year on November 1st, All Saints Day, St. David’s would hold a short service in the cemetery for those who had died. Father Angelo would meet, usually, a dozen members at the gate and they would sing, pray and share in the Lord’s supper in the cemetery as a reminder that we are always connected in worship to the whole Body of Christ, alive and dead. This year, the new young assistant priest, Father Michael, decided he would hold a youth event the night before. An All Saints Eve or Halloween Vigil. The youth and young adults would gather in the cemetery to play games, eat candy, sing songs, and keep vigil through the Eve of All Saints Day. They wold pitch tents, camp out and join with All Saints worship in the morning. As the Halloween Vigil was announced in the weeks prior, many members came to Father Angelo, voicing their concern that such and event would be ‘disrespectful’. And Father Angelo always encouraged them to be patient and see how things would go. 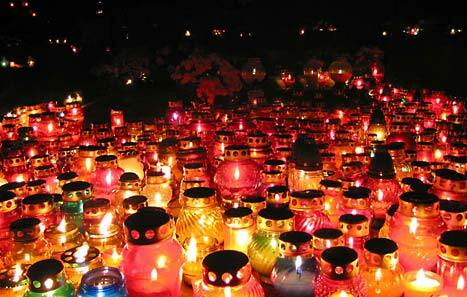 All Saints Day is an important day for Christians throughout the centuries. It has been a day of prayer to remember the saints and pray for those who have died. All Saints Day is even transferred to Sunday when it is on another day of the week so that we can all observe the occasion. All Saints Sunday is a herald of the closing year and the coming of Advent. In only two weeks, comes Christ the King Sunday, the final Sunday of this church year. And so in this regard, All Saints takes us to places of beginnings and ends, birth and old age, life and death. So perhaps it is worth asking, what exactly is a saint? A saint is someone who is holy and blessed right? Well that has something to do with the sermon that Jesus is preaching today. It is the familiar sermon on the plain or Beatitudes. However, not to be confused with Matthew’s more spiritual version of the sermon on the mount. In Matthew’s Gospel Jesus says, “Blessed are the poor in spirit”, where as today in Luke, Jesus simply says, Blessed are the poor”. As Jesus announces blessings, he names conditions that don’t seem like blessings. Poverty, hunger, weeping, hatred. We can try to feel poor, and hope that in a room full of middle class Canadians we are poor enough to be blessed. But imagine if we were at the soup kitchen or mental hospital. Could we really hope that we are poor enough, hungry enough, weeping enough, hated enough to receive the blessing? Normally we think of blessings as good things. Wealth and health mostly. But Jesus blesses the opposite. And Jesus curses conditions we consider blessings. Being rich, being full, laughter, being well liked. As Lutherans we say we are sinners and saints, but Jesus is pretty clear. Maybe we are more sinner and less saint. On All Saints morning, members of the congregation gathered at the front gate of the cemetery. They could see the youth and young adults scurrying about, getting cleaned up and ready for worship. Father Angelo arrived. He sensed the discomfort among the members gathered. Many who came for All Saints worship had loved ones buried in the cemetery. Husbands, wives, mothers, fathers, brothers, sisters. People were whispering to each other and pointing into the cemetery. They seemed agitated. Father Angelo was suddenly worried, maybe the Halloween Vigil wasn’t a good idea after all. It was time to begin, so he led the procession to where the youth and young adults were waiting. It is easy for us to get wrapped up in who is blessed and who is cursed, who is a saint and who is a sinner. We like these neat categories, they allow us to define and control the world around us. We can justify ourselves and pass judgement others. But Jesus is not interested in our categories. Jesus wants to muddy the waters. Jesus wants to upset and overturn our nice and neat boxes. Cursed are the well liked. And if today were just about the beatitudes, it would be enough to say that Jesus redefines blessings and curses. But today is All Saints day and we are forced look at the mortality, the death of loved ones and our own death. And so we expand these blessings and curses to include life and death. On All Saints we might add another set of blessings and curses to the sermon on the plain. Cursed are the living, for they will face death head on. Blessed are the dead, for they will be given New Life. We add this set of blessings and curses because that is what All Saints day is about. The Messiness of death and the messiness of life. Today, we are reminded that God likes to mess with the categories, and where we can only see the clear distinctions of life or death, of being dead or alive, Jesus sees both. Jesus says we are both. Sinners and Saints. Both dead and alive. As Father Angelo led the group of worshippers through the cemetery, they began to notice just what the youth had been up to. There was a small candle on every headstone, flickering in the early morning sun. And some headstones, there were notes. Notes that said things like, “Thanks for taking care of our church. Or thanks for letting us stay the night. Or thanks for sharing your faith with us”. Some had art work, others had flowers. The worshippers looked all around as they made their way to the place of worship. The youth had set out folding chairs and prepared a table for communion. They were waiting with blankets and hymnals. As the group finally met the youth, Father Angelo was worried the worshippers would be upset. He held his breath. “That was the first night my husband hasn’t been alone since he died. Thank you. Will you stay with me one night when I am gone”. The girl didn’t know what to say, but Father Angelo simply smiled to himself. Jesus’ sermon about blessings and curses do more than overturn our categories. On All Saints Sunday the sermon reminds us what the Kingdom of God, what the company of saints truly look like. It is not an uniform group of holy and blessed people. But rather a diverse, rag tag, group of misfits and sinners. A group of people who wouldn’t otherwise be lumped together. Today we remember those who had died, and Jesus turns that category on its head too. God proclaims that we, the living, are dead from the moment we come into this world. We are on our way to death, and in the waters of baptism we are drowned to sin. But in Christ, who is the first of the resurrection, God declares that the dead will be raised to new life. God declares that we, even though dead, are alive. And on this All Saints Sunday, as the categories of blessed and curse, of sinner and saint, of dead and alive are muddied and confused, Jesus makes clear that we are all a part of the One Body of Christ, which is not limited by time or space, and nor by life or death. And so today, we may remember the saints in prayer, but it is God who gathers us together with them into the worship of the heavenly hosts. And as it happens each Sunday, the veil between us and them, between earth and heaven, between creation and God, is a little thinner. This is what the radical sermon on the plain is all about, and this is why we hear it today on All Saints day. As we are faced with the categories of sinner and saint, of dead and alive, God is breaking down those barriers. God is reminding us that the difference between cursed and blessed is not as vast as we think. That life and death are not the great chasm we imagine. That sinners and saints don’t go to opposite places, but rather we are made one in Christ. Christ who brings us all into the One Body. Into One Body that worships together, prays together and cares for each other across boundaries that seem unbreakable to us, but are easily set aside by God.